Leighton Collins’ Takeoffs and Landings—the Crucial Maneuvers and Everything in Between provides expert, flight-tested techniques pilots need in these critical phases of flight, in every contingency of arrival and departure, VFR and IFR, single and twin, tricycle gear and taildragger. Now back in print, this revived aviation classic is about the realities of flying into and out of an airport, the practical matters of taking off and landing safely and skillfully, every time. Collins’s classic text is full of analysis and insight into each and every takeoff and landing—not only why things happen, but how to manipulate the factors toward the desired results. Trim, control feel, flaring, correcting imperfections, airplane design characteristics, atmospheric conditions, pilot skill or lack thereof, airport design, flight trends — it's all in here, with emphasis throughout on stall/spin avoidance and the inherent risks of flying low and slow. 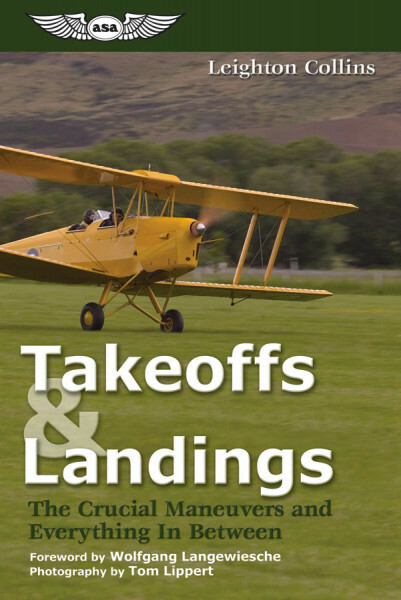 Readers will find five different ways of touching down, three ways of landing crosswind, an excellent description of a light twin on takeoff with one engine out, and an account of a perfect flight and a good landing from takeoff roll to full stop. Along with his more than half a century of personal experience, Collins shares tips and secrets from his observations of airline pilots during their routine check flights, reading military manuals, attending manufacturer’s flight training programs, and interviewing aviation’s think-tanks: Bob Buck, Fred Weick, Howard Piper, William Lear, etc. The book’s Foreword is by Wolfgang Langewiesche, author of Stick and Rudder. Collins's son, aviation author Richard L. Collins, writes an opening note for the new printing, and the new photography throughout is by Tom Lippert. Leighton Collins is reflected in this book: practical, personable, realistic, and authoritative. Leighton first soloed in 1929 in an open-cockpit biplane. He founded Air Facts magazine, which he edited and produced almost single-handedly for 35 years, a magazine widely recognized as the pioneering force for improvement of the aviation safety record. While he contributed a chapter to Stick and Rudder, Langewiesche’s classic flight manual, Takeoffs and Landings was the first book in Mr. Collins’s long writing career.